The Indian Express and it’s ridiculous coup! 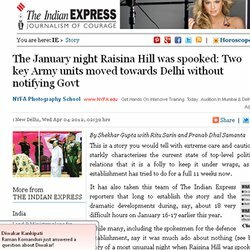 This is my reading of an Indian Express article that has been in the news for the series of not-quite allegations it vaguely made about the Indian Military. This is a story you would tell with extreme care and caution. It is a story of a most unusual night when Raisina Hill was spooked as never before in peace time. Sooooooooooooo I guess we are done being cautious then. But do tell, do tell! bolo, bolo! what happened?